Mentioned in the Ebers Papyrus of around 1500 B.C. and depicted in 4,000-year-old Egyptian tomb drawings, sesame was highly valued by the Ancient Greeks, Egyptians and Romans. Their nutty, sweet aroma with a rich, milk-like butter taste becomes even more intense with an added depth of flavor when roasted. 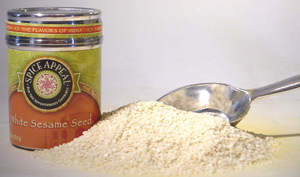 Used to add texture to bread and rolls, biscuits, crackers, pastries, cooking oils and salad dressings. Used in Middle Eastern dips, sauces and sweets.